Blush is rated 4.7 out of 5 by 300. Add a little colour to cheeks with Nars Blush, a lightweight blush that uses transparent pigments to create the ultimate soft and sheer look. 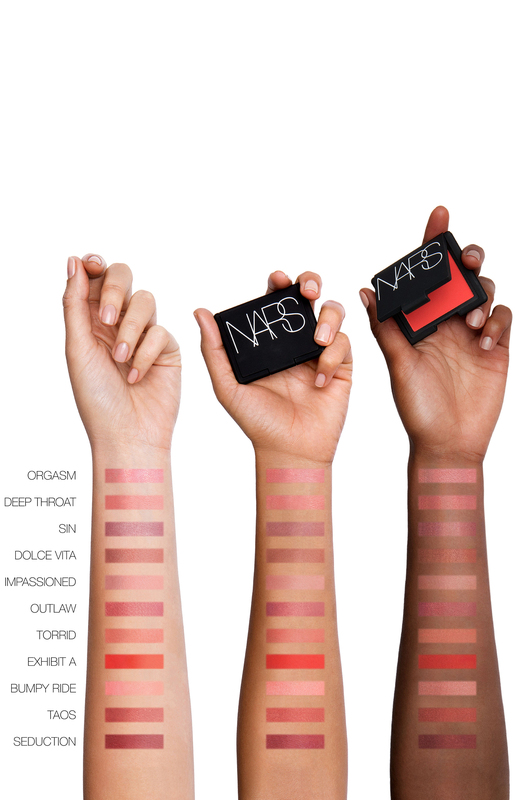 Available in a vast range of shades, there is a Nars Blush available for every skin tone and any desired finish. The blush glides on with a practically weightless feeling for a ultimate natural finish, but is easily buildable for when more colour is desirable. Creating a natural, healthy looking glow that looks lit-from-within, Nars Blush is also enriched with vitamin E that contributes to a soft and smooth sensation by helping to nourish the skin. The powder is micronised so it is easily blended with other shades to create a look that is truly unique. Nars Blush is the ultimate, easy to use blush, enriched with vitamin E it glides onto the skin for a sheer, natural glow and is easy to layer for extra drama. Rated 5 out of 5 by beautyproductaddict from The best! Nars products have long been a fixture in my make-up bag, but this blush is one of my faves. The colour is such that it compliments all skin tones and it's a dream to apply and super easy to blend. The slight shimmer is also an added bonus, plus it's also incredibly long lasting. Rated 5 out of 5 by Faffa from Nars blush has an extra depth bought this as a fresh spring/ summer blush. Works really well the same as my previous Nars shade did for autumn. Shade would work for any skin tone. Bought on line and colour was as I had expected. A really efficient delivery service, would use again. Rated 4 out of 5 by CHIARA B from Lovely Lovely, lovely lovely. I own many different shades of the uber famous Nars blushes. I love the shimmery ones, my preferred one being Madly. Madly is a cold beige/tan with a lot of shimmer. When I first got it I was a bit tanned and I said: this will never show up. In fact, when swatched this looks like a splendid highlighter.... I was WRONG! this stuff is pure magic. I applied on the apple of cheeks and below the cheek bone and on the jaw line, just for a bit of contouring. And ...tah-dah! My face was sculpted. I was in awe! I could not believe the result. It did not pack up colour but it DID a true sculpting thing! I do not know how to explain it better, but this is a blush you'll wear when you want to look beautiful on a no-makeup face (well we're faking the *no-makeup face* of course). Its' just natural and luminous and barely there but ... there. Then I wanted to venture more into "matte " blushes - Amour is the perfect shade... it is a color that surprisingly compliments a lot of different skin tones, a sort of muted peachy pink that looks very dark in the pan but is lighter on the skin. It is very natural - Looks so beautiful and fresh - and gives you just that healthy looks and you do not seem to wear any blush... just that it's your natural cheek colour. Totally a must have. Rated 5 out of 5 by karokaro from Staple for every gal I love nars overall - I have been using their products for over 15 years. The packaging is never revamped but it definitely looks timeless and great in your makeup drawers or vanity. But overall the pigment is fantastic! It's super vibrant and it lasts all day! Rated 5 out of 5 by Racheliris from Gorgeous long lasting blush NARS blush is a staple for me. I have several colours for different seasons. I particularly like Gaiety for the summer which is a lovely true pink. It really gives you a nice healthy look when you've got a bit of a tan. It stays on well and is easy to blend.